*I was sent samples to facilitate this post. 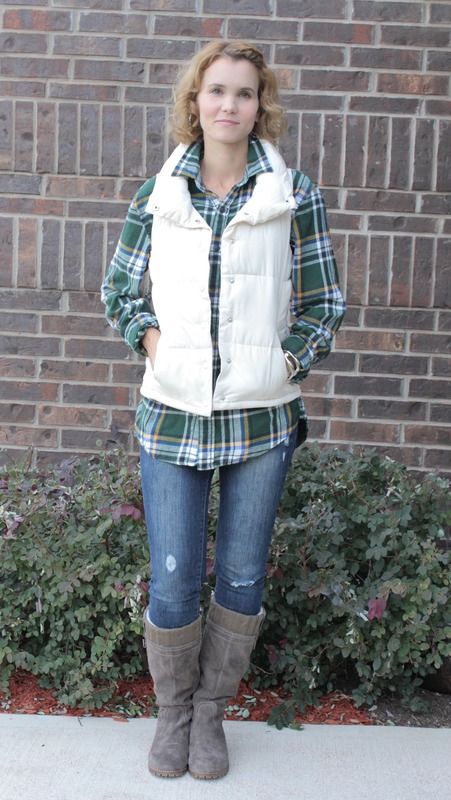 What do you get when you take a big flannel, a white puffy vest and the perfect pair of boots? 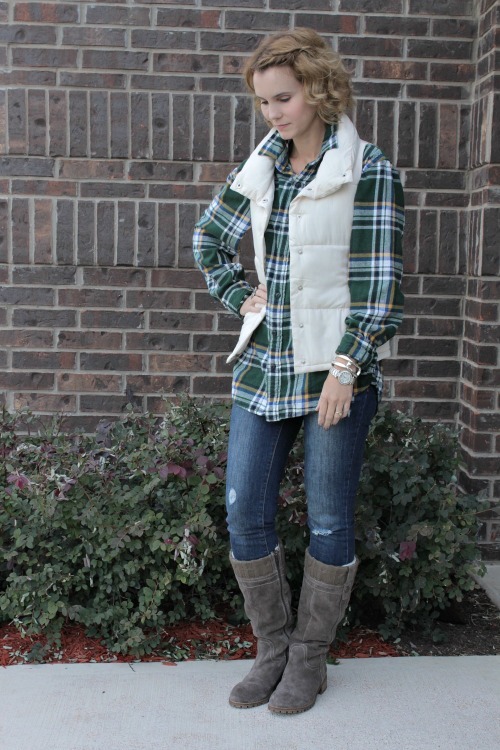 The perfect fall/winter outfit of course! It’s boot season and I couldn’t be happier. I have a lot of boots – black boots, cowboy boots, combat boots, casual boots and now the newest addition to my boot collection – these Autumn by BJORNDAL from Rack Room Shoes. My kids did their back to school shoe shopping at Rack Room Shoes, and with their Buy One Get One 50% off, we walked out of there with a lot of shoes. Recently, my husband, my two teenagers and myself each chose a pair of boots from Rack Room Shoes and I’m happy to say the temps are down low enough to where we can actually wear them. This week, you’ll see what each of them chose, but today it’s all about me. Ha! Rack Room Shoes publishes a new style report with each new season and right now, they’re showing you what’s trendy when it comes to boots. From riding boots and Chukkas, to booties and combat boots; there’s a boot for everyone. 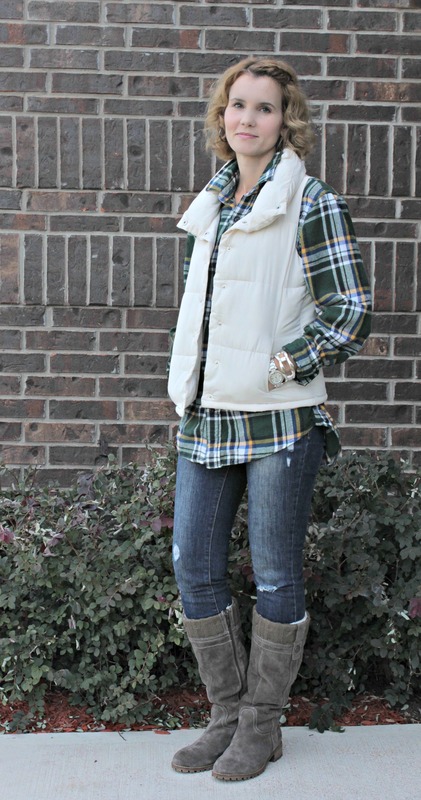 My blogging friend Andrea did a fantastic job showing us different ways to style a wedge bootie. If you think you can’t pull them off or you have no idea what to wear them with, she gives us some fabulous outfit ideas. I chose to go with a casual style of riding boot. I love the boot sock look these Autumn by BJORNDAL have. They’re also fleece lined and just about the most comfortable pair of boots I’ve slipped on my feet. I’ve worn them with a blazer, sweater, cardigan and the flannel/vest combo – which is one of my favorite outfit ideas this season. Is it time for a new pair of boots? Or maybe you want to branch out of the style rut you’re in and try something a little different like a chukka or wedge boot. (Wait until you see my daughter in her Chukkas. So stylish and pretty!) Go for it! Whoops. Nevermind. Just saw where you mentioned it. Thank you for linking to me friends, let collaborate together soon!!! A collaboration sounds great to me!! My absolute favorite combination in the world. Thank goodness for the cooler temps – When I lived in Seattle we could wear this almost all year round! We moved here from Colorado and could usually break out the flannel and boots in October. Although I am from the Austin area, I moved away when I graduated…swearing never to return. 🙂 I LOVE Seattle! My husband is from Kelso, Washington. Thanks for stopping by “Dusty”! Looks comfy and cozy! I’m ready for jeans and boots, too. My new faves are from London Fly! I’ve been eyeing a pair of Old Gringos too! Hi Sarah! I received my first pair of Gringos and I love them. Thank you for stopping by! This is my favorite combo this season. You look fantastic! I am on the hunt for some new boots. Do they have a good selection of riding boots? Thank you Avery! Rack Room Shoes does have riding boots and they’re super cute!! I love the boots and vest! 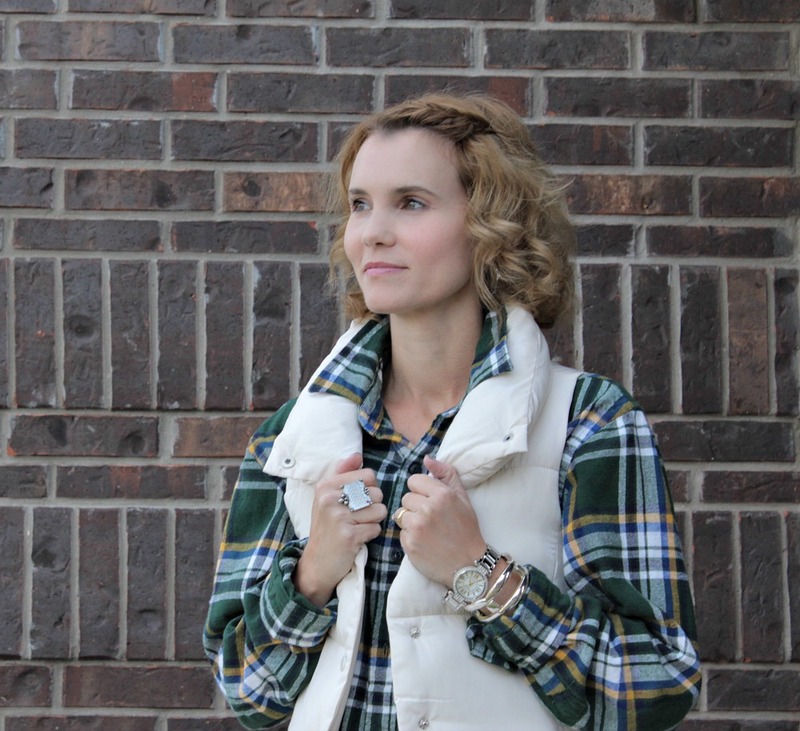 I can not believe boot and vest season is here already!